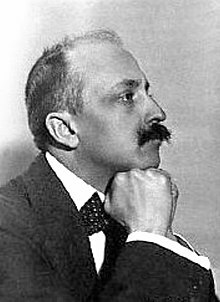 Filippo Tommaso Emilio Marinetti (December 22, 1876 – December 2, 1944) was an Italian ideologue, poet, editor, and main founder of the futurist movement of the early 20th century. O my brother Futurists! All of you, look at yourselves!.. ..In the name of that Human Pride we so adore, I proclaim that the hour is nigh when men with broad temples and steel chins will give birth magnificently, with a single trust of their bulging will, to giants with flawless gestures. ..there is no longer any beauty except the struggle. Any work of art that lacks a sense of aggression can never be a masterpiece. While an artist is labouring at his work of art, nothing prevents it from surpassing Dream. As soon as it is finished, the work must be hidden or destroyed, or better still, thrown as a prey to the brutal crowd which will magnify it by killing it with its scorn, and thereby intensify its absurd uselessness. We thus condemn art as finished work, we conceive of it only in its movement, in the state of effort and draft. Art is simply a possibility for absolute conquest. For the artist, to complete is to die. We affirm that the world's magnificence has been enriched by a new beauty: the beauty of speed. A racing car whose hood is adorned with great pipes, like serpents of explosive breath – a roaring car that seems to run on grapeshot is more beautiful than The Victory of Samoth-race (1910). We had stayed up all night — my friends and I — beneath mosque lamps hanging from the ceiling. Their brass domes were filigreed, starred like our souls; just as, again like our souls, they were illuminated by the imprisoned brilliance of an electric heart. On the opulent oriental rugs, we had crushed our ancestral lethargy, arguing all the way to the final frontiers of logic and blackening reams of paper with delirious writings. Avevamo vegliato tutta la notte — i miei amici ed io — sotto lampade di moschea dalle cupole di ottone traforato, stellate come le nostre anime, perchè come queste irradiate dal chiuso fulgòre di un cuore elettrico. Avevamo lungamente calpestata su opulenti tappeti orientali la nostra atavica accidia, discutendo davanti ai confini estremi della logica ed annerendo molta carta di frenetiche scritture. 1. We intend to sing to the love of danger, the habit of energy and fearlessness. 2. Courage, boldness, and rebelliousness will be the essential elements of our poetry. 4. We affirm that the beauty of the world has been enriched by a new form of beauty: the beauty of speed. A racing car with a hood that glistens with large pipes resembling a serpent with explosive breath.. ..a roaring automobile that seems to ride on grapeshot — that is more beautiful than the Victory of Samothrace. 7. There is no longer beauty except in the struggle. No more masterpieces without an aggressive character. Poetry must be a violent assault against the unknown forces in order to overcome them and prostrate them before men. 8. ..Time and space died yesterday. We already live in the absolute, because we have already created eternal, omnipresent speed. 11. We shall sing the great masses shaken with work, pleasure, or rebellion: we shall sing the multicolored and polyphonic tidal waves of revolution in the modern metropolis; shall sing the vibrating nocturnal fervor of factories and shipyards burning under violent electrical moons; bloated railroad stations that devour smoking serpents; factories hanging from the sky by the twisting threads of spiraling smoke; bridges like gigantic gymnasts who span rivers, flashing at the sun with the gleam of a knife; adventurous steamships that scent the horizon, locomotives with their swollen chest, pawing the tracks like massive steel horses bridled with pipes, and the oscillating flight of airplanes, whose propeller flaps at the wind like a flag and seems to applaud like a delirious crowd. Noi canteremo le grandi folle agitate dal lavoro, dal piacere o dalla sommossa: canteremo le maree multicolori e polifoniche delle rivoluzioni nelle capitali moderne; canteremo il vibrante fervore notturno degli arsenali e dei cantieri incendiati da violente lune elettriche; le stazioni ingorde, divoratrici di serpi che fumano; le officine appese alle nuvole pei contorti fili dei loro fumi; i ponti simili a ginnasti giganti che scavalcano i fiumi, balenanti al sole con un luccichio di coltelli; i piroscafi avventurosi che fiutano l'orizzonte, le locomotive dall'ampio petto, che scalpitano sulle rotaie, come enormi cavalli d'acciaio imbrigliati di tubi, e il volo scivolante degli aereoplani, la cui elica garrisce al vento come una bandiera e sembra applaudire come una folla entusiasta. It is from Italy that we are flinging this to the world, our manifesto of burning and overwhelming violence, with which we today establish 'Futurism',for we intend to free this nation from its fetid cancer of professors, archaeologists, tour guides, and antiquarians. È dall'Italia, che noi lanciamo pel mondo questo nostro manifesto di violenza travolgente e incendiaria, col quale fondiamo oggi il «Futurismo», perchè vogliamo liberare questo paese dalla sua fetida cancrena di professori, d’archeologhi, di ciceroni e d’antiquarii. Hail! great incendiary poets, you Futurist friends!.. Hail! Paolo Buzzi, Federico de Maria, Enrico Cavacchioli, Corrado Govoni, Libero Altomare! Let's flee the city of Paralysis, devastate Gout, and lay the great military Railroad along the flanks of Gorisankar, summit of the world! We left the city with firm and nimble strides, as if dancing in our desire to find everywhere obstacles to overcome. Around us, and within our hearts, the immense intoxication of the old European sun as it swayed between wine-colored clouds.. .That sun struck us in the face with its great torch of flaming purple, then flared out, vomiting itself into the infinite. A cry went up in the airy solitude of the high plains: 'Let's Murder the moonlight!' Some ran to nearby cascades; gigantic wheels were raised, and turbines transformed the rushing waters into magnetic pulses that rushed up wires, up high poles, up to shining, humming globes. So it was that three hundred electric moons canceled with their rays of blinding mineral whiteness the ancient green queen of loves. To the conception of the imperishable, the immortal, we oppose, in art, that of becoming, the perishable, the transitory, and the ephemeral. Art deals with profound and simple moods.. ..Let us suppose that the artist – in this instance [the artist] Picabia – gets a certain impression by looking at our skyscrapers, our city, our way of life, and that he tries to reproduce it.. ..he will convey it in plastic ways on the canvas, even though we see neither skyscrapers nor city on it. Try to live the war pictorially studying it in all its mechanical forms (military trains, fortifications, wounded men, ambulances, hospitals, parades, etc). Before us, art relied on memory, an anxious re-evocation of an Object lost (happiness, love, a landscape), and hence was nostalgic, static, charged with suffering and distance. With Futurism, instead, art is turning into art-action, which is to say, into will, optimism, aggression, possession, penetration, delight, brutal reality within art (example: onomatopoiea; —example: noise-tuners = motors), geometrical splendor of forces, projections forward. Thus, art is becoming Presence, new Object, new reality created with the abstract elements of the universe. The hands of the passéist artist used to suffer for the sake of the lost Object; our hand will twitch for the new Object to be created. That is why the new Object (the plastic complex) has miraculously appeared in your hands. Quote in: Fortunato Depero & Giacomo Balla 'The Futurist Reconstruction of the Universe' in: Direzione del Movimento Futurista, March 11, 1915. Transl. Caroline Tisdall, 1973. And now I am obliged to tell you what it is that clearly distinguishes Futurism from anarchism. The latter, denying the infinite principle of human evolution, brings its forward-looking viewpoint to a halt in the ideal of universal peace, a stupid paradise of people caressing in open fields or beneath billowing palm trees. We, instead, affirm that one of Futurism’s absolute principles is the continuous development and unending progress, both bodily and intellectual, of man. All this will have left you disposed to understand one of our principal Futurist efforts, which consists of abolishing in literature the apparently indissoluble fusion of the two concepts of Woman and Beauty. This ideological a fusion has reduced all romance to a sort of heroic assault that a bellicose and lyrical male launches against a tower that bristles with enemies, a story which ends when the hero, now beneath starlight, carries the divine Beauty-Woman away to new heights. Novels such as Toilers of the Sea by Victor Hugo or Salammbô by Flaubert can clarify my point. It is a matter of a dominant leitmotif, already worn out,c of which we would like to disencumber literature and art in general. I have said that Marinetti was.. ..exceptionally gifted, and I should add that I never saw him twiddling his thumbs even for ten minutes.. ..beside his desk he often kept piles of books in which he would write dedications.. ..invariably with the purpose of spreading the word about Futurism.